Like most subjects in science, an accepted theory is developed from the combined efforts of multiple researchers. The Endosymbiotic Theory is no different. Many in the scientific community claim that Dr. Lynn Margulis had been the first to propose the Endosymbiotic Theory. Though it is true that she was the first to claim the endosymbiont nature of mitochondria and chloroplasts with a handful of conclusive evidence, she couldn’t have done it alone. Many before her breakthrough during the late 20th century also had contributions to the entire formation of the theory. She just put it all together. The American biologist, Ivan Wallin, actually was the first to suggest the idea that the eukaryotic cell was composed of microorganisms. As we will see later, this idea was very significant in the formation of the Endosymbiotic Hypothesis. In 1927, he also explained how bacteria could represent the primary cause of the origin of species. Thus, the creation of a species can happen through endosymbiosis. 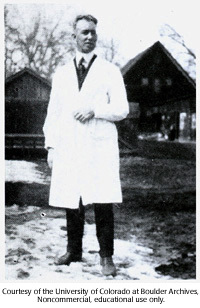 Ivan Wallin would work with K. S. Mereschkowsky to form the idea of symbiogenesis, but their theories were originally rejected due to the assumption that mitochondria and chloroplasts do not contain DNA. However, this was proven false during the 1960s, when Hans Ris revived the theory. 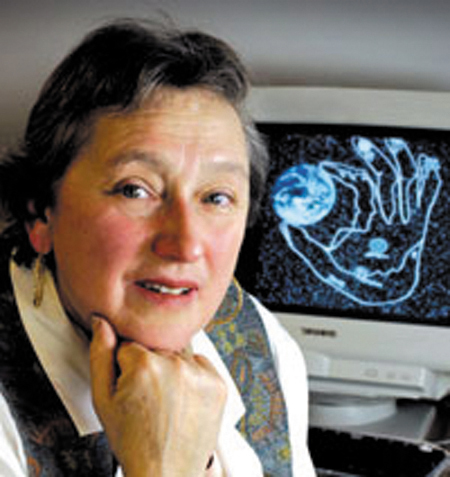 In 1981, Dr. Lynn Margulis became the leading figure behind the endosymbiotic hypothesis with the publication of her work, Symbiosis in Cell Evolution. Her research was the primary support for the endosymbiotic theory; it claims that the origin of mitochondria were separate organisms that originally entered into a symbiotic relationship with eukaryotic cells through endosymbiosis. Essentially, she argued against the common notion of random mutation, which is accepted as the main source of genetic variation. She thought that a symbiotic merger played a much larger role in the creation of new genomes. In her view, the DNA in the cytoplasm of cells originated from genes of bacteria that became organelles, instead of from mutation of genetic drift. 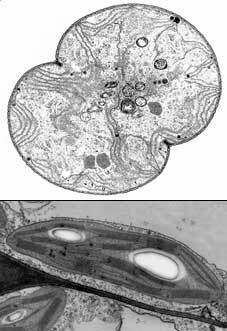 Margulis and others hypothesized that chloroplasts (bottom) evolved from cyanobacteria (top). At the University of Massachusetts Amherst, Dr. Lynn Margulis studied the origins of mitochondria and chloroplasts in eukaryotic cells. She found that these organelles originated as prokaryotic endosymbionts that later resided within eukaryotic cells. According to her theory, mitochondria evolved from aerobic bacteria, and chloroplasts evolved from endosymbiotic cyanobacteria. Her research found convincing evidence in support of this theory. In support of the Endosymbiotic Theory, Margulis proved that free-living bacteria along with other microorganisms have a tendency to merge with larger life forms quite often. By examining prokaryotes, eukaryotes, and organelles, she claimed endosymbiosis as the best explanation for their many similarities. As mentioned earlier, she recorded her findings in her work “Symbiosis in Cell Evolution” (1981). In addition to her primary explanation on the origin of mitochondria and chloroplasts, Dr. Margulis also proposed that eukaryotic flagella and cilia derived from endosymbiotic spirochetes. Her argument for this claim is not as strong since they do not contain any DNA, nor do they show ultrastructural similarities to prokaryotes. Thus, there is little support for this idea. Despite the facts, peroxisomes, which also contain no DNA, have also been considered to result from an endosymbiotic origin. Christian de Duve actually proposed they were the first endosymbionts. For her astounding work on the endosymbiotic hypothesis, she was awarded the National Medal of Science from President Bill Clinton in 2000. She’s also a member of the National Academy of Sciences and the Russian Academy of Natural Science. She has been called “one of the most successful synthetic thinkers in modern biology” by E.O. Wilson. In all, her research has significantly helped launch the status of the study of endosymbiosis from hypothesis to theory.